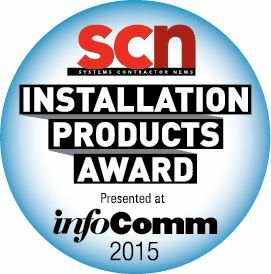 The finalists for the 2015 SCN/InfoComm Installation Product Awards have been revealed. The awards showcase the most innovative commercial AV products of 2014. The ballot of finalists was chosen by an independent panel of judges by narrowing down the field of submissions to no more than four products per category. The ballot will remain open until May 13, and winners will be announced in June during InfoComm 2015 in Orlando, FL. Crown’s DriveCore Install Series of amplifiers is a complete line of high performance installation amplifiers based on Crown’s proprietary DriveCore technology. The DCi Network Display amplifiers have an Audio Video Bridging (AVB) etherent port and are the first amplifiers to be AVB certified by the AVnu Alliance. Versatile, compact and highly energy efficient, DCi Series amplifiers continue the unbroken Crown tradition of leadership in professional and commercial power amplifier technology. Revolabs’ Executive Elite wireless microphone system brings boardrooms and conference rooms the market’s first and only cloud server option — allowing access to microphone status, audio and radio signal strength, and system performance via an intuitive web-based interface. Using a new distributed architecture, the system’s remote antenna receiver and base-units connect via standard CAT6 cable with PoE support while contemporary microphones provide enhanced audio pickup, signal-to-noise ratio, simplicity, and digital signal communication over wireless links. QLX-D Digital Wireless System delivers outstanding digital wireless sound for mid-size events and installations, including corporate facilities, academic institutions, houses of worship and more. Setting QLX-D apart is its spectrum efficiency and signal stability, allowing users to operate more channels on-air than any other wireless system in its class. Furthermore, QLX-D includes networked control, AES-256 encryption and simplified setup and operation —all at a competitive price, making digital wireless accessible to purveyors of mid-size events. This compact desktop terminal combines all communication tools required in meeting rooms: microphone and speaker for superior intelligibility, multi-touch capacitive touchscreen to view/share documents, 10 channels of HD video on demand, internet access, camera for video capture, E Ink nameplate, electronic voting and numerous additional features. Embracing the convergence between AV and IT, this terminal helps avoid line-of-sight challenges with screen or camera positioning in VTC applications and makes every seat the best seat! The SymNet Radius 12×8 EX DSP updates SymNet Radius 12x8's 12-input, eight-output format with a new expansion slot, making it possible to take the total audio input/output count to 24 within the same, compact 1U format. The I/O expansion slot supports SymNet option cards, including analog, digital, AEC and VoIP. This flexibility paves the way for multiple system configurations and gives expandability to integrators, allowing post-installation I/O expansion without the need to swap-out a DSP. ProGrid is a premium-grade audio and signal transport solution based on the open AES3 and AES10 (MADI) standards. It is designed for transport, distribution, and routing of audio, intercom, video signals, and control data. All serial data, word clock sync, analog, AES, MADI audio with timecode, and all major brand intercom signals are transmitted synchronously at extremely low latency and across long distances. Up to 1024 channels can be matrixed across short or long distances. Biamp Systems’ TesiraFORTÉ series of digital audio processors extend AVB to application-specific settings. Consisting of eight preconfigured models (four each: AVB and non-AVB models) designed to bring greater simplicity and more audio options to conferencing, telephony, and VoIP environments. Each TesiraFORTÉ solution is equipped with 12 mic/line inputs, eight channels of configurable USB audio, eight mic/line outputs, four-pin GPIO, and 128x128 channels of AVB. TesiraFORTÉ uses a customer’s existing cabling infrastructure, providing cost-effective networked audio. Apollo Enclosures manufactures all-weather LCD TV enclosures that have revolutionized the outdoor products category with its slim, sleek design to environmentally house LED ultra-thin televisions from 39 to 42 inches, 46 to 50 inches, and 55 to 60 inches. Key features, such as anti-reflective safety glass and filtered, temperature controlled airflow are built into a powder-coated aluminum body. Enclosures come complete with a weatherproof mounting solution as standard equipment. The credenza’s design complements an integrator’s installation workflow with foundational frames delivered quickly from stock, allowing the integrator to immediately start the installation. The rack frame is paired with a custom furniture finishing kit that is manufactured to order and shipped separately to the jobsite. The credenza’s new styles, furniture finishes and options reflect current design trends to help AV integrators work with the commercial design community in better integrating technology in modern spaces. Tripp Lite’s Charging Station provides security, organization, charging and syncing for USB devices. Integrators can help protect their customers’ valuable iPads and tablets from theft thanks to the locking doors and side panels. Removable/reconfigurable dividers allow customers to customize the charging station to their needs. It can be mounted on a wall, stacked and mounted on casters. Perfect for schools, houses of worship, and retail environments. Ships fully assembled for immediate install and use. The ConnexSys Video Wall Mounting System solves the most common installation problems: speed, alignment, serviceability, and rigidity. Strut channel install aligns an entire row and removes the need for spacers. Six points of PowerZone tool-free adjustment are all found in one location. Depth can be set anywhere between 4 to 7.3 inches (102-186 mm). RapidDraw display release gives access to any display. The mounts extend up to 13.7 inches (348 mm). Added rigidity prevents accidental screen shift. FlexView display carts and stands are easy to integrate and cost effective with a slim profile, contemporary design, and safety certification for strength and durability. Application engineered for effortless integration of display screens, power and connectivity, they feature the lowest-profile display mount in the industry and enable mounting of larger displays than competitively priced options. Available with electric or manual display height adjustment for optimal ergonomics, in stationary or mobile configurations with rugged casters for long-lasting use and high maneuverability. This mount is one part rear projection blend screen frame (1x 14 x 85 inches), one part box frame ladder structure (16 box frames connected rigid curved screen frame), and one part projector mount frame ceiling mounted on the box frame ladder structure. The challenge on this custom mount was that of vibration. This structure was engineered around the ducting, supports, plumbing, vents, and electrical of the building to help eliminate any possibility of screen vibration. The Habitat Outdoor Digital Media System is a weather resistant outdoor enclosure, with a modular design to allow for expansion from single to double or triple displays using the same bolt pattern base plate. This unique solution can be customized for compatibility with any OEM display, and has an operating temperature of 0 to 50 degrees C. It also features a unique airflow system and positive airflow to keep out dust and dirt all without the use of an air conditioner resulting in up to 70 percent savings in electricity usage. The SiliconCore Magnolia P1.5 is a 1.50mm pixel pitch LED display with low power consumption. At a phenomenal 444,900 pixels-per-square-meter, it launched in 2014 as the most advanced and high quality resolution LED display on the market. Offering the smallest pixel pitch currently available in HD format and a super-fast refresh rate of over 2,000 Hz, the Magnolia delivers an incredible viewing experience, even at close proximity. Utilizing state-of-the-art, nano-optical particle diffusion, the new NanoClear solution allows objects to seemingly float in space. The clear display can accept input from nearly any device or content management system to produce specific messaging on the clear display. Extremely slim and ultra-lightweight, all NanoLumens visualization solutions are energy efficient and feature a bright, high-resolution picture quality. The 55-inch LG 55LV77A video wall with the world’s narrowest (3.5mm) bezel-to-bezel size and special shine-out technology delivers stunning image quality. The super-narrow bezel enables the monitors to be arranged in a variety of configurations up to a 15-by-15 matrix with 225 total displays. It features IPS technology, to ensure accurate color saturation and contrast at wide-angle viewing. With Direct LED backlighting technology and high-brightness uniformity, displays deliver 1080p. Draper takes screen technology another step into the future with TecVision Engineered Surface Technology. Available in eight formulations, TecVision features both white and gray 4K-ready surfaces, all of which are certified by the Imaging Science Foundation (ISF). TecVision features wide viewing cones, even on higher gain formulations. Instead of using mass-production methods, TecVision screens are individually formulated, programmed, and manufactured for quality, consistency and uniformity. New formulations can be created to meet emerging needs. The PT-RZ670 Series is the world’s first 6,500 lumens of brightness in a laser light source 1-chip DLP projector and features light control for high 10,000:1 contrast, optimizing the sharpness of each image. The series, with DIGITAL LINK (HDBaseT) includes advanced technologies such as a 3D color management system, dynamic sharpness control, and AI scene control, ensuring long lasting image quality, consistent brightness and color for 20,000 hours. The Canon REALiS WUX6000 Pro AV Installation LCOS projector is designed to deliver bright, 6000-lumen high-resolution WUXGA (1920 x 1200) widescreen video and still images. Equipped with Canon’s LCOS Technology with AISYS-enhancement, this projector displays vivid images. Features include a wide range of optional Genuine Canon projection lenses, a motorized lens-shift function for easy positioning, advanced professional calibration settings, including edge-blending and four-point keystone correction. Connectivity is provided via HDMI, DVI, and other leading network interfaces. Producing over 20,000 hours of illumination without a single bulb replacement, Digital Projection’s HIGHlite LASER delivers a stellar 11,000 lumens of application-enabling brightness. With virtually no incremental costs to the end user compared to lamp-based projectors, the HIGHlite LASER pairs gorgeous three-chip DLP imagery with solid-state, long-life illumination. Image edge blending, as well as advanced geometric warp correction are standard, as is support for active 3D functionality with frame rates up to 144 Hz. Pulse2 (Ref. PLS350-3G) is a mixer/native matrix switcher offering diverse connectivity through 14 source plugs: universal analog, DVI-D, HDMI, and 3G-SDI. Pulse2 offers low-latency scaling and easily switches between any of its input plugs without fade through black or loss of sync. It features a mixer mode with two outputs (program and preview) and one 3G/HD/SD-SDI output plug useable as record output or program clone. Pulse2 can be controlled through the AIR application, RCS2. DMC-4K input and output cards enable full 4K/60 signal distribution. The HDMI input or output handles 2K and 4K signals with support for HDCP 2.2, deep color, and 7.1 surround sound audio. The unbalanced audio output also provides a two-channel down mix to feed an audio distribution system. Built-in USB HID signal routing allows a connected computer to be controlled by a mouse and/or keyboard located at a lectern, conference table, or another remote location. Barco’s E2 raises the bar for 4K screen management, offering superior image quality, exceptional input and output density, and high durability. A true “show in a box,” E2 offers eight PGM outputs with mixable PIPS, and four scaled AUX busses, and is the only system expandable beyond eight outputs without additional external processing and routing. It supports 4K content up 60 Hz, handling 28 inputs, 14 outputs, eight independent mixers and a dedicated multiviewer. Blackmagic Design’s Smart Videohub 40 x 40 is an advanced multi-format SD, HD, and Ultra HD SDI router with built-in large five-inch high-resolution video monitoring, and spin knob control. Smart Videohub 40 x 40 has a unique visual routing user interface and the latest 6G-SDI technology, allowing any combination of SD, HD, and Ultra HD routing all on the same router at the same time. Eliminate your customer's panic and expense when presentation adapters go missing or get lost! Make Liberty's breakthrough DL-AR adapter ring part of every install and feel the love from your customers! Our patent-pending tensile aircraft strength ring and clamp locks in the HDMI cable going to your display while any adapter you may need is at your fingertips. The SS-USB-CHRG Keystone DC to USB charger incorporates the necessary circuitry to communicate with smart devices providing the correct charging wattage, up to 12 watts. It comes with a universal power supply, and an optional power supply capable of remotely powering up to six units simultaneously from 165 feet via 16AWG cable is available. It’s easily mounted in FSR’s Intelligent Plate Solutions wall plates, table or floor boxes, and infrastructure solutions that accept standard keystone snap-ins. The AMX HydraPort HDMI Module with retractable cable (also available in DisplayPort, etherent and RGB-audio modules) is unlike any other architectural connectivity solution on the market. Featuring no assembly, no adjustments, and no terminations, this retractor module is completely innovative and installs quickly and easily with no special mounting. The module includes an AMX-designed flat, high-speed, HDMI cable powered by RedMere to ensure absolute best picture quality in a compact design. Specifically designed for desktops, huddle spaces, and conference rooms, the Revolabs FLX UC 500 offers new possibilities for video conferencing and any computer-based unified communications. With a combination of dual speaker elements, four microphones, and unsurpassed audio processing, the FLX UC 500 improves all aspects of audio handling for conferencing needs. Users simply connect the device via USB to any computer for use with Skype, Microsoft Lync, Vidyo, Cisco Jabber, WebEx, and many other applications. Encode, capture, and stream AV content through a variety of PC applications or directly to the network with AV Bridge CONFERENCE. AV Bridge CONFERENCE allows you to integrate soft codecs, including Lync and Jabber, into traditional AV designs and works with any software application running on any OS. The AV Bridge CONFERENCE can support selectable balanced and unbalanced audio for far-end audio conferencing applications and includes media streaming via USB and IP streaming. The AMX Sereno Video Conferencing camera was purpose-designed to support conferencing applications in huddle spaces and smaller meeting rooms, where traditional cameras typically have narrower fields of view and cannot capture all of the meeting participants. In addition to ultra-wide field of view, Sereno captures HD-quality video, offers outstanding voice capture, and features a sliding mechanical video shutoff mechanism to ensure the room remains secure and that nothing can be seen through the shutter. Solstice collaboration software enables multiple users to connect simultaneously to a shared display from laptops and mobile devices over WiFi/etherent networks, allowing them to share and control content. Solstice increases meeting productivity by more deeply engaging participants and unleashing intellectual capital. With Solstice, users can share unlimited content in real time; present, moderate, or collaborate; integrate with in-room AV control panels; centrally manage displays; and utilize multi-touch/4K displays. Pexip Infinity is the industry’s most comprehensive any-to-any meeting platform radically enhancing and simplifying the user experience for face-to-face communications. For conferences that include any variety of clients and endpoints such as Microsoft Lync or Skype, traditional videoconferencing solutions, and simple web browser-based video endpoints, the Infinity platform reinvents the way enterprises meet on any device. Purely software-based and virtualized, the platform uses existing on-premises and cloud infrastructure to deliver video, audio, and data collaboration. Kramer’s VIA Collage allows users to instantly connect wirelessly, collaborate effortlessly and effectively, and truly engage all the participants in a meeting. It delivers a TRUE-Collaboration experience in conference rooms, boardrooms, and larger meeting spaces. With any laptop or mobile device, users can wirelessly share any size file, annotate and illustrate with a whiteboard, and stream uninterrupted full HD video (up to 1080p60), and much more. Visix e-paper room signs are the most cost-effective option to display schedules from your existing event management system – an inexpensive, wireless, and battery-operated solution from Visix. These attractive seven-inch displays mount easily, don’t require any cabling, and can be paired with a custom faceplate of your own design. They update wirelessly via RF communication, and batteries are only activated when information changes. This allows batteries to last up to three years or 10,000 updates. This open pluggable specification expansion board allows for full HDBaseT receiver support directly integrated into your compatible NEC display. Fully certified by the HDBaseT Alliance and when coupled with a certified HDBaseT transmitter, this product helps simplify installations by accepting video, audio, and control over a simple category six cable. Planar UltraRes Touch combines an 84- or 98-inch multi-touch experience with stunning 4K image clarity. It offers a best-in-class solution for digital signage interactivity using a large viewing area, the highest image resolution and enterprise-level features. Ideal for public display applications such as way-finding, product catalogs or interactive applications designed to promote customer engagement, Planar UltraRes Touch displays offer 32 points of multi-touch, multi-user technology, so multiple users can interact at the same time. All-in-one presentation system that integrates built-in DigitalMedia 4K technology, 4K up/down scaler, IP-based 3-Series control system, 10x1 multimedia source switcher, mic mixer, and audio DSP in a single rack-mountable package. The onboard auto-configuration program (.AV Framework) provides plug-and-play connectivity with Crestron Connect It cable caddies, quick system setup from an iPad or touchscreen, including touchscreen GUI, and native connectivity to Crestron Fusion enterprise management software without any custom programming. The FLEX-IO16 Expansion Unit provides 16 ground closure inputs and lamp outputs, RS-232, and IP communication to expand the capabilities of FSR’s FLEX controllers and with third-party systems. The GUI control program allows programming of the 16 I/O channels. Each of the 16 inputs can be programmed with its own command strings to be communicated during a button press, hold, or release. Lamp outputs can toggle, blink, or alternate from internal or external commands. The AMX NetLinx NX-4200 integrated controller is a programmable network appliance, specifically designed to ensure the utmost in network security, including dual network interface cards with power, enabling two discrete network interfaces for unrivaled security and includes a four-port switch with PoE, allowing you to power PoE devices over a secure, isolated network. Additionally, IPv6 and wired 802.1x support modern networking standards for internet protocol IPv6 and port-based network access. Vaddio’s RoboSHOT 12 is the only camera in its class that produces Tri-Synchronous Motion - a camera control protocol that allows all three (pan, tilt, and zoom) axes to move simultaneously. This algorithm calculates the position and velocity of the smooth, direct-drive motor movements between the presets so pan, tilt, and zoom arrive at the preset shot simultaneously. Say goodbye to unnatural, jerky camera movement. The RoboSHOT 12 produces a smooth, “on-air” camera motion. The Hearing HotSpot is an innovative, new listening technology that allows any venue to stream live audio via Wi-Fi from TVs, music sources, or live programs directly to an individual’s personal smartphone or tablet. To listen, an individual simply connects to the local Hearing Hotspot Wi-Fi provided by Williams Sound, downloads the free Hearing Hotspot app from the Google Play or Apple App Store, and selects the audio channel they want to hear. With features including wireless connectivity and a suite of optional lenses for greater installation flexibility, the Christie GS Series delivers the needed requirements for today’s demanding visual display projects and is suitable for 24/7 environments without a loss of image quality. Easy to install and use with input options such as Display Port, HDMI, DVI, and HDBaseT, Christie GS Series provides clean, radiant images with up to 5400 ANSI lumens with picture-in-picture functionality.